Leagoo S9 Pro is the advanced version of the Leagoo S9 that caught our attention at the 2018 Mobile World Congress in February. The Pro version was on showcase at the Mobile Electronics Exhibition yesterday in Hong Kong, alongside the Leagoo XRover. The S9 Pro comes with lots of features that’s not on the initial version. Apart from having a bigger battery capacity and screen size, it has a bigger storage space and faster octa-core processor. Want to know more? Stay with me. 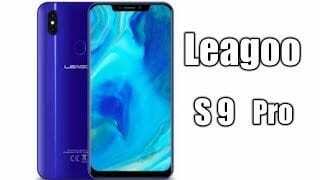 What is Leagoo S9 Pro Price and Availability Status? Still has its combination of Metal and Plastic here, from the back we can see the dual rear shooters have been minimized. Nonetheless, the cameras are still in the trending vertical position at the top left corner with the LED flash in between them. The design and color combination still reflects light beautifully like we saw at the 2018 MWC with the S9. A rear fingerprint scanner is still in place, even though it comes with Face ID. There isn’t much difference in terms of design here to be honest, the S9 Pro will just be relatively bigger and heavier. Leagoo isn’t only famous for making clones, they also move with the current trend. 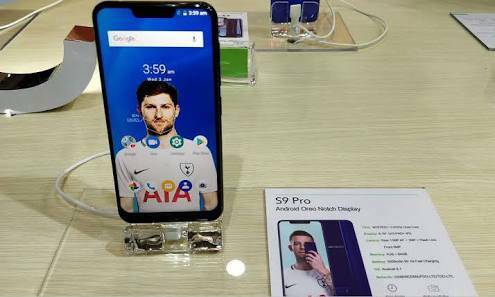 The Leagoo S9 Pro sports the Notch display as well, although compared to the S9, the notch here is more attractive. The bottom bezel on the S9 Pro is curved, while the S9 has a straight one. The Pro version comes with a bigger 6.18-inch FHD+ IPS LCD capacitive touchscreen for big screen lovers. The screen boasts of 1080 x 2160 pixels in resolution and 402 pixel per inch density, meaning it has better screen qualities than its little brother. Furthermore, the screen has full lamination technology, 178 degree viewing angle, while a Dragontrail Glass protects it. Under the hood is the MediaTek Helio P23 MT6763T chip with Octa-core processor and 64-bit CPU architecture. The 8-cores of processor here reaches an impressive speed of 2.0GHz with 16nm process technology, offering a faster performance than the S9. In the graphics department, the ARM Mali-G71 MP2 graphics processor is in charge and clocks at 770MHz. The Pro version comes with the same 4GB RAM space on the S9, but with a faster memory speed of 933MHz. While the storage space has been expanded further to 64GB, for all your storage needs. You can upgrade up to 128GB as well, using a memory card. The Leagoo S9 Pro runs on Android 8.1 Oreo out of the box. The dual 13MP + 2MP shooters at the rear comes with a LED flash and other features ready for all photography needs. The 13MP Sony camera has f/2.0 aperture, 75 degree wide angle lens, 5P Lens and 1.133um pixel size. While the 5MP selfie camera has f/2.0 aperture as well, 4P Lens and OmniVision PureCel Sensor. Powering the Leagoo S9 Pro is a 5000mAh non-removable Li-Po battery with fast charging technology. With the fast charging feature, it shouldn’t take up to 2.1 hours to fully charge up the battery from 0% to 100%. The Leagoo S9 Pro is available on Shopping stores from $199 (N70,000) to $249 (N90,000). Click on the links above to view the latest Leagoo S9 Pro price & availability on Shopping stores.